Poultry Shrink Bags provide superior protection for all your poultry- from fresh and frozen whole birds to bone-in chicken breast packs. These high-abuse shrink bags for poultry virtually eliminate leakers, while the high shrink rate and gloss creates an attractive exterior. Available in clear, translucent or opaque colors. High Barrier Shrink Bags are durable, multi-layer bags that provides both protection and outstanding clarity. 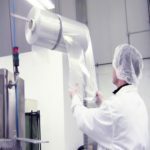 Designed for a high shrink rate and easy peelability, Cook-In Shrink Bags are available in Cook-In Strip, Cook-In Ship and Post-Pasteurization formats. Designed for high-abuse products, Bone Guard Shrink Bags provides edge-to-edge, full coverage puncture protection without patches. Keep work areas cleaner, use less warehouse space, and reduce bag waste with convenient, perforated Packaging on a Roll for meat, poultry, and cheese products. Learn about the benefits and trends in recyclable plastic packaging and sustainable labeling for meat and poultry processing and how Flavorseal, a leader in packaging solutions, has developed innovative eco-friendly food packaging technology. Flavorseal customers have access to the company’s Technical Service Team, a group of experienced engineers and maintenance experts based around the country who travel to customer locations and work remotely to troubleshoot food packaging process and equipment issues and recommend solutions. Flavoseal earned Non-GMO Project Verified Seal for Food Seasoning Transfer Technology, adding to their gluten-free, Kosher and organic certifications for food packaging. Let Flavorseal develop a strategic solution for your commercial food packaging challenges. Tell us more about your food packaging needs.